The 7th World Peace Forum will be held from July 14 to 15 at the Tsinghua University. Yang Jiechi, member of the Political Bureau of the Communist Party of China (CPC) Central Committee and Director of the Office of the Foreign Affairs Commission of the CPC Central Committee will attend and address the opening ceremony. Former foreign political dignitaries including former Afghan President Hamid Karzai, former Pakistani Prime Minister Shaukat Aziz, former President of the European Council Herman Van Rompuy and former President of the European Commission Jose Manuel Barroso will attend the forum upon invitation. Diplomatic envoys to China from more than 40 countries will attend the opening ceremony and 70 scholars from 23 countries' think tanks will speak at the forum. About 270 scholars and distinguished guests in the field of international relations will be present at the event upon invitation. The World Peace Forum is the first non-governmental high-level global forum held by China. It is organized by Tsinghua University with the assistance from Chinese People's Institute of Foreign Affairs. The forum, which was initiated in 2012, has been held six times. It aims to provide a platform for the strategists and think tank scholars from countries around the globe to discuss international peace and security. The theme of the 7th World Peace Forum is "Constructing a Security Community: Equality, Equity and Justice". Q: The 8th Ministerial Meeting of the China-Arab States Cooperation Forum (CASCF) concluded in Beijing yesterday. The meeting adopted and signed three important documents. How do you comment on the important outcomes of this meeting? A: The 8th Ministerial Meeting of the CASCF, which was held in Beijing yesterday, has attracted great attention from all of you. Thanks to the concerted efforts of China and Arab States, this history-making and future-oriented meeting, which focuses on cooperation and promotes peace, has achieved fruitful outcomes. Yesterday morning, President Xi Jinping made an important speech at the opening ceremony, announcing the establishment of a forward-looking strategic partnership for comprehensive cooperation and common development between China and Arab States and a string of long-term, innovative and pioneering initiatives, which has opened up a new chapter in and pointed out the way forward for China-Arab States ties. Yesterday afternoon, State Councilor and Foreign Minister Wang Yi held in-depth discussions with ministers in charge of foreign affairs and other fields from 21 Arab States, following the spirit of President Xi Jinping's speech. Their discussions focused on the joint efforts to promote the Belt and Road cooperation, enhance strategic mutual trust, realize rejuvenation, achieve win-win outcomes, and strengthen inclusiveness and mutual learning, during which more than 100 items of agreement were reached. At the meeting, the two sides signed three documents: the Beijing Declaration, the implementation of plan for the CASCF events in 2018-2020, and an action declaration for joint implementation of the Belt and Road Initiative, presenting a clear, systematic and complete blueprint for the development of China-Arab States relations in the near future. 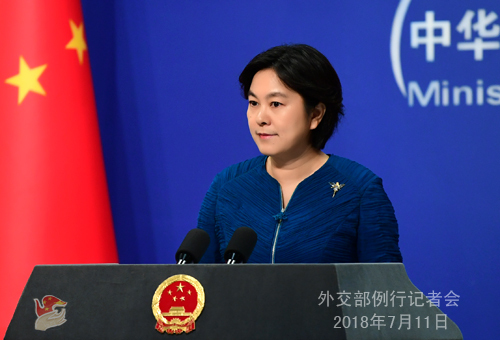 The Beijing Declaration expounds on the contents of the China-Arab States strategic partnership, reaffirms support for each other's core and major interests, summarizes shared proposals on such international and regional issues as the Palestinian issue, counter-terrorism and the UN Security Council reform, and defines the direction for the development of China-Arab countries relations and joint cooperation. The implementation of plan for the CASCF events in 2018-2020 stipulates new projects and new measures for cooperation in nearly 20 areas, such as trade, economy, industry, energy, and culture, and decides to give full play to activities like workshops of Center for China and Arab States Reform and Development Studies, Beidou Forum, energy cooperation conventions, entrepreneur conventions and art festivals. The action declaration for joint implementation of the Belt and Road Initiative highlights the leading role of the Belt and Road Initiative and aims to realize connectivity in policy, infrastructure, trade and capital and bring people closer under the Silk Road spirit of peace and cooperation, openness and inclusiveness, mutual benefit and win-win outcomes, and mutual learning. The two sides also agreed on the key areas and priorities where actions and measures will be taken to further promote the Belt and Road Initiative. Participants from the Arab States speak highly of President Xi Jinping's remarks delivered at the opening ceremony and the outcomes of the Ministerial Meeting. They fully agree with the new blueprint President Xi Jinping outlined in his speech for Arab States' relations with China, stressing that there is a high degree of alignment between the two sides on the direction and vision of foreign policies. They would like to work with China to forge a new type of international relations and build a community with a shared future for mankind. They look forward to participating in the Belt and Road Initiative and working with China to implement the outcomes of the Ministerial Meeting, deepen practical cooperation in various fields, and move forward Arab States-China Strategic Partnership. This CASCF Ministerial Meeting is a great success. It sounded a clarion call for China-Arab States cooperation to march forward in the new area. 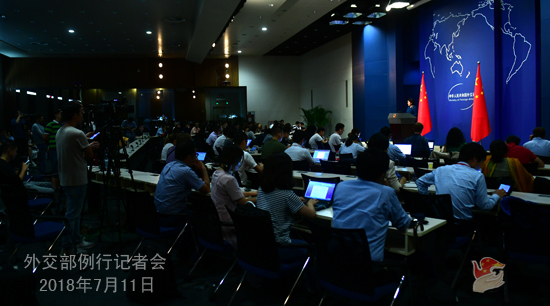 The Chinese side is very satisfied with the outcomes of the Ministerial Meeting. As strategic partners walking together into the future, China and Arab States will accompany each other in our respective pursuit of national development and rejuvenation as well as in our efforts to deepen friendship and cooperation and create a bright future of peace, stability and common prosperity. Q: The Trump administration has threatened further 10% tariffs on $200 billion of Chinese imports in the United States. We know MOFCOM has already responded to that, but do you have any additional comments? In particular, when exactly will China release a full list? Whether there have been any additional attempts to start talks again with the US side? And whether the response from China will involve the so-called qualitative measures and what those might be? A: This morning, the Spokesperson of China's Commerce Ministry issued a statement on it and made clear China's stern position. I would like to stress once again that the US action is the quintessential trade bullying. We will take necessary countermeasures to safeguard our legitimate and legal rights and interests. The multilateralism, free trade and rules-based order are now pit against unilateralism, protectionism and power games. China will join hands with the international community to stand on the right side of history and champion multilateral trading system and rules. As to what countermeasures will be taken by the Chinese side, the Commerce Ministry will deal with it in a timely and proper manner. Q: The US network security company Fire Eye issued a report, claiming that China interfered in Cambodia's elections through cyber spying. What is your comment? A: I am not aware of the situation you mentioned. China's position on cyber security is quite clear-cut. We firmly oppose and combat all forms of cyber attack. China is a staunch upholder of cyber security. Cyber security is a global issue and it bears on the common interests of all countries. We call upon the international community to conduct dialogue and cooperation to jointly address the issue of cyber security on the basis of mutual respect, equality and mutual benefit. It is not constructive to make groundless accusations and speculations without solid evidence. Q: We have noted that the trade war initiated by the US has triggered concerns worldwide. IMF Managing Director Christine Lagarde said that the US must bear the consequences its tariff measures afflicted on the world trading system. Roberto Azevedo, the Director-General of the World Trade Organization (WTO) warned that the global trading system is wobbling. Former Federal Reserve Chairman Alan Greenspan said that it is the American people that are paying for those tariff hikes. Governor of the Bank of England Mark Carney said that the US will end up being the biggest loser in a full-blown trade war. What is your comment? A: Presently, all countries have been economically integrated into the global industrial chain and global value chain to varying degrees. We are all interdependent and our interests are closely intertwined. It is the right choice to lend a helping hand to others after one becomes well-off. Clinging to the outdated zero-sum game mindset and willfully provoking a trade war will harm the interests of not only the two parties involved but also all other parties in the global industrial chain. It will produce no winners. 40% of China's commodity exports and two thirds of its high-tech exports are manufactured by foreign enterprises in China. As the Spokesperson of China's Commerce Ministry said, the US side is firing at the whole world as well as itself. The relevant remarks of the authorities in the international economic field you mentioned just now fully demonstrate that the irrational actions taken by the US are quite dangerous and they harm others as well as the US itself and go against the will of the people. I want to stress once again that the multilateralism, free trade and rules-based order are now pit against unilateralism, protectionism and power games. The international community should make concerted efforts to firmly oppose unilateralism and protectionism and uphold the multilateral trading system and free trade rules. It is the duty of all responsible countries. Q: Does the Chinese side believe that it is still possible to restart the talks with the US on the trade issues? A: Regarding the trade issues between China and the US, our position is quite clear. Though a trade war is the last thing we want, we are in no way afraid of fighting one. 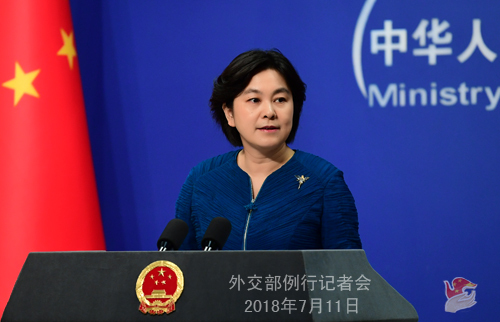 The Chinese side will take resolute and forceful measures in a timely manner to safeguard its own legitimate and legal rights and interests and uphold the multilateral trading system and rules. Q: Recently, some western media quoted Pakistani officials as saying that Pakistan is experiencing a sharp increase of debt risk and a shortage of foreign exchange reserves. China is expected to provide loans to the Pakistani side, otherwise Pakistan will ask the International Monetary Fund for help once again. If so, it may affect some infrastructure projects under the China-Pakistan Economic Corridor. What is your comment? A: The relevant reports severely deviate from the facts. Pakistani Finance Minister Shamshad Akhtar Detho has issued a statement to clarify this, stressing that the Pakistani side will steadfastly advance the China-Pakistan Economic Corridor (CPEC). The Chinese side has noted the shortage of foreign exchange reserves in Pakistan. We believe that the Pakistani side can overcome the temporary difficulties to maintain the steady development of its economy. In recent years, the CPEC has played a positive role in maintaining the relatively high economic growth in Pakistan and received the wholehearted support from the Pakistani government and people. We believe that the CPEC will be advanced in a steady manner in accordance with the consensus reached by China and Pakistan without being disturbed by other factors. Q: The US electric car maker Tesla's CEO Elon Musk is in China for a visit now. Is he meeting any members of the Chinese government? A: I have no relevant information.